Veeva Commercial & Medical Summit, North America — Veeva Systems (NYSE:VEEV) today announced mobile innovations in Veeva CRM that empower field teams with the information they need from any device. Veeva CRM’s new real-time architecture combined with the Sunrise user interface (UI) provide a consistent and intuitive mobile experience across all Apple and Windows devices, including phones, tablets, and laptops. Now the field can have the right information at the right time for improved execution and productivity. Sales reps and medical science liaisons expect to access CRM details in real-time from the device that works best for them. With Veeva CRM, information such as activity, customer, and product data will now sync automatically so it is always available and accessible from any device – whether planning on a laptop at home, checking a mobile phone on the road, or engaging a healthcare professional (HCP) with a tablet. Also, push notifications provide immediate visibility into the most important information or the next best action to take. 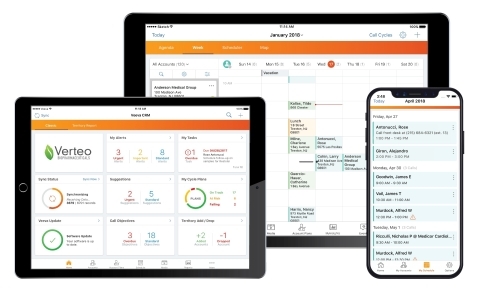 The Veeva CRM Sunrise user interface is expected to be available this summer for Apple iOS and early 2019 for Windows OS. Real-time sync for Veeva CRM is expected to be available for Apple iOS in fall 2018.